The peak tourist season is slowly drawing to an end. Operators in the sector, economists, politicians and ordinary people will be passing judgement on whether this year’s tourist season has been a success, with most using quite different metrics to measure this. A few years ago a former Minister of Tourism said he believed that Malta’s tourism industry has still sufficient capacity to take on more tourists, especially in the leaner winter months. Some hoteliers agree as, despite the ever increasing number of tourists, their occupancy rates are still not what they would like them to be as more tourists are opting for hired accommodation. The tourism industry has undergone dramatic changes in the last two decades as low cost airlines have enabled millions of people, who previously could not afford expensive flights, to travel for their holidays at bargain prizes. Malta is such a small market that it is realistically feasible to predict that the number of tourists visiting Malta will continue to rise despite tough competition from neighbouring destinations. But gauging success simply by the number of visitors to our islands is not only inaccurate but outright misleading. Malta runs the risk of other tourist destinations that are realising that more tourists does not necessarily mean a better economic and social return for their people. Earlier this year the local government of Barcelona declared that they would not be granting any further permits for the building of hotels in the city as they could no longer cope with the millions of visitors visiting the city especially for weekend breaks. Venice discourages mass tourism by raising prices of tourist services and by imposing heavy fines on those visitors who do not observe tough civic regulations when visiting the city. 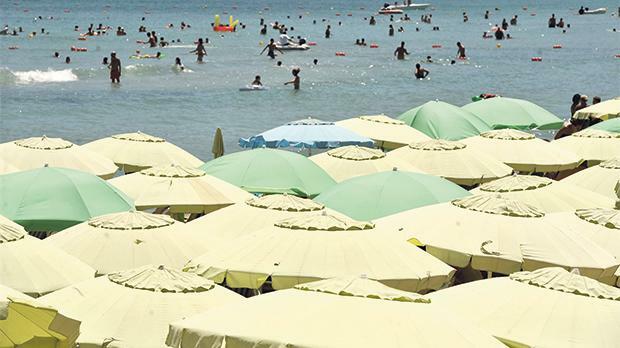 This summer holiday resorts in Spain and the Greek islands have had some nasty experiences with the mayhem that mainly young tourists caused when visiting determined to let out steam at the expense of the locals. Many established tourist destinations in Europe are asking whether mass tourism is indeed giving them the kind of return that they expect from their investment in the industry. Luckily in Malta we have not reached such breaking point. But there are signs on the wall that should help us shake off any complacency that may be affecting us. This year we have seen a refreshing start to some sort of coastal management. It is a good thing not to let private beach facility operators monopolise our scarce beaches. But there has been little evidence that the same political will exists to challenge the hundreds of people that grab land adjacent to the coast to park their caravans on a semi-permanent basis or who even build shanty towns on prime sites adjacent to our beaches. Political parties shamefully bend over backwards to accommodate these land grabbers who are clearly breaking the law while making rendering parts of our coastline an eyesore. The ever present massive construction projects added to the traffic gridlock that has become a permanent feature of life in our country, especially in the tourist frequented areas, is certainly not adding value to the experience that most visitors right look for when paying for their holiday in Malta. We may continue to hit the record number of visitor that we will probably achieve this year, but the economic added value and social returns may well diminish fast. What I also find very worrying is the fact that our catering industry is not attracting as many young people as it used to. Our hotels and restaurants are increasingly employing foreign workers because presumably our young people do not see a future in this sector. Part of the blame is on operators who obsess on the bottom line of their annual profit statement without caring much about investing in the skills of their workforce. We will undoubtedly continue to hear industry leaders singing what the New York Times columnist Frank Bruni described (in a different context) as a ‘melodious aria of self-praise’. Don’t we all love seeing records being broken? The questions we should be asking ourselves are whether the industry is offering good quality jobs to our young people; whether ordinary people approve of the social and environmental cost that sections of the industry are imposing on our society; and whether the economic added value after one factors in the equation the physical infrastructural costs is indeed improving.